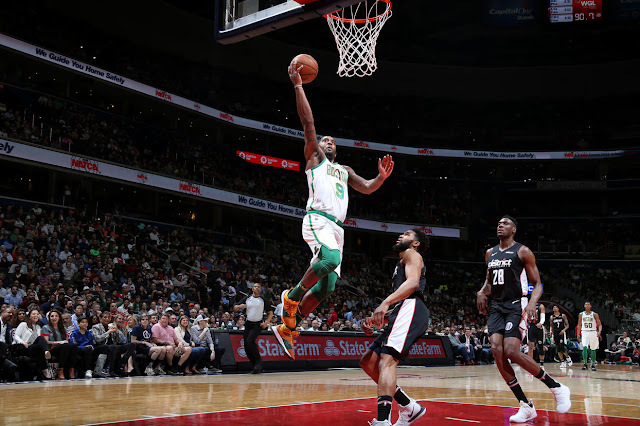 Brad Wanamaker finally got significant minutes last night in the Celtics win over the Washington Wizards - and he made the most of them. In 28 minutes, he notched 17 points, six rebounds and seven assists - finishing with a plus/minus of +17. He won't be seeing that much floor time in the post-season, but he will have an impact. Brad has only logged 9.5 MPG this season, but his production last night fits his season-long, per-36-minutes projection quite well (14.7 PPG, 4.3 RPG, 5.9 APG, 1.3 SPG, Plus/Minus of +7.6). He is shooting 48% on field goals, 41% on 3-pointers and 86% from the foul line for this season. I love Brad Wanamaker's game. Just a solid all-around player who will do whatever he can to contribute whenever he's on the court. The 6'4", 29-year-old guard signed for the rookie minimum ($831,000) this season and will be a free agent this summer. If Terry Rozier leaves and Kyrie Irving remains, Wanamaker as backup point guard to Kyrie and Marcus Smart next season makes sense. He would get more playing time, and the Celtics may get a bargain contract. Brad will never be a star in the NBA, but he plays a solid, versatile game. He may have a place on the Celtics roster, at least for next season.